When conducting focus groups or depth interviews, the first topic should be general and easy to discuss. The purpose of the first topic is to cast a wide net, and get people talking and feeling comfortable. Introduce the first topic for discussion, after building early rapport in the introduction. The first topic serves as a warm up; it gets people thinking and talking about the main subject. It also continues to build rapport. Conducting focus groups or depth interviews is not difficult, when you start off easy. Once you have covered the first topic, people should be talking and feeling comfortable. Conversation should be flowing. Now introduce other topics… the major topics of inquiry in the moderator guide. The guide helps you, while conducting focus groups or depth interviews. As you direct conversation, dig to find out why and how. In other words, what lives below their first answers… feelings, perceptions, beliefs, and knowledge. A moderator’s real value exists in her or his ability to find out why and how. A good moderator knows how to dig beyond the first answers. You dig with follow-up questions, probes, and prompts. You dig with advanced moderating techniques: laddering and projective techniques, looking for feelings, emotions, perceptions, beliefs and cultural conditioning. You dig in a non-threatening way. Don’t annoy anyone or pester them when conducting focus groups or depth interviews. When conducting focus groups or depth interviews, you may ask people to perform some activities. Examples of activities include reading and marking up concept statements, viewing ads, drawing, completing surveys, looking at pictures, sorting cards, trying a product. Write activity directions in the moderator guide, so you are clear about what to do. Make sure your respondents understand what to do. Read simple, clear directions to them, then ask them if they understand what to do. When you write on a white board or easel, look at your respondents. Don’t turn your back on them. Let them know you are listening. Watch and manage time. Keep a clock or watch in front of you during the interview. Check how much time you have for each topic and activity, but don’t let your watching the time distract respondents. Stay on track and stick to the schedule, as best you can. If you find you run out of time for a topic, you may need to revise your moderator guide. In a face-to-face interview, look respondents in the eye and listen to their answers. Show understanding and empathy. Nod your head. Look at them. Lean forward. Look interested. In a telephone interview, notice the respondent. Use the respondent’s first name and pay attention to his or her answers. Focus on what the respondent says and how he or she says it. Listen to tone and pace. Then play back in a similar way. During a focus group or depth interview, appear neutral. Ask, listen, and ask. Listen for respondents’ perspectives, their state of mind, their feelings, perceptions, and opinions. Use their words when asking follow-up questions. Be friendly, polite, and respectful, and most people will usually respond in kind. Ask questions in a non-threatening way. Avoid biased, threatening, or annoying questions. If questions agitate respondents, stop the question or ask in a different way. Or drop it, if it continues to annoy. If a question confuses a respondent, rephrase it. Ask in a different way. If the question still does not work, skip to the next question. As a moderator, don’t give your opinion to respondents. When respondents ask for your opinion about a product or brand. Don’t answer them. Your answer will bias them. Rather, turn the question back to them. There may be times when you need to play devil’s advocate. Challenge respondents’ answers that contradict previous statements don’t make sense. Challenge in a friendly way. Keep the tone upbeat and positive. Don’t argue. For example, say, “Help me out. I don’t understand.” Then state the contradiction. Don’t judge their answers, during a focus group or interview. Some respondents may ask who is sponsoring the research. Say you cannot tell them if it is a blind study. Even if people guess the sponsor correctly, don’t confirm it, unless you have permission.And do so late in the focus group or depth interview. Experts and executives may use technical language you don’t understand. When you hear something you don’t understand, ask for meaning and clarification. Play the role of student. Let them be the teacher. Learn the technical language from early interviews, and use it for later interviews. Also, prepare for technical language before your interview. Read an industry glossary or trade magazine. Become familiar with the language of the industry and product category, before you interview executives and experts. When moderating executives or experts, appear as the competent student, while conducting focus groups or depth interviews. Occasionally, a respondent will try to challenge you. Don’t let a bully or dominant personality bait you. Stay composed, keep on track, and they will usually cooperate with you. In some focus groups, dominant respondents show up. They try to dominate the discussion. Your job is to manage them so every respondent gets equal talk time. Tell the dominant respondent you want to hear from the others. Don’t look at the dominant respondent when you ask a question. Raise your hand as if to say stop when the dominant respondent tries to talk, and look at someone else. If a respondent gives flippant answers, stay neutral and show respect. Be professional. Preserve your cool. Don’t sound frustrated. Continue to ask questions. If they see you don’t fluster easily, they usually cooperate. If you feel rapport breaks with a respondent, try to reconnect by finding common ground. It may be difficult to reestablish rapport if you have hit an emotional disagreement, or if they dislike you. If the respondent refuses to cooperate, stop the interview or focus group. It happens rarely. In a focus group, take a break. And privately ask the respondent to leave, or ask the focus group facility manager to handle the respondent’s exit, during the break. Closing in this way may identify new topics, and also confirms important topics to respondents. When you are done, tell them. Practice builds your moderating skills. 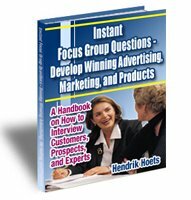 Practice conducting focus groups with friends, family, and colleagues. Practice on strangers. Most people you interview will be complete strangers. Practice with customers, prospects, and experts. They are the real test. Record your interviews. Learn from recordings. Listen to how you sound, and how people answer. Ask what you could do better. Could you follow up more? Probe more? Remember to ask respondents’ permission to record. Learn from your transcriptions. Get you recordings transcribed. Read them and ask what you could do better. Learn from your mistakes. Make notes. If someone watches your face-to-face interview, ask for a critique. Start with depth interviews. Build your moderating skills with them. Depth interviews are easier than focus groups. You talk to one person at a time. Then after about ten depth interviews, graduate to conducting focus groups. It’s not difficult, if you learn the skills, are determined to succeed, and practice. The more you practice you get, the easier conducting a focus group will become. Also, see moderating part 1 about establishing rapport. It's the first step in conducting focus groups or depth interviews.